“If Luther doesn’t win, they’re not going to say we picked up 25 points in a very short period of time, they’re going say, ‘Donald Trump, the president of the United States, was unable to pull his candidate across the line,’” he predicted to 7,500 Alabamians at a rally on Friday night as Mr. Strange looked on. His blurting out of his political stage directions was a vintage moment of Trumpian indiscretion. But it also had the benefit of being accurate. The contest between Mr. Strange and Roy Moore, a former State Supreme Court justice and evangelical firebrand, is the most significant test yet of the president’s power to sway the party’s conservative base. “If Roy Moore wins, Bannon and all the other of those people will pop out of the woodwork everywhere,” said Senator Richard C. Shelby, the veteran Alabama Republican, referring to the former Trump adviser Stephen K. Bannon, who has taken a leading role against the preferred candidate of his former boss. Moore was removed from the bench for defying a court order to take down the Ten Commandments from the State Supreme Court. In the past, he supported banning homosexual acts. The Senate Democratic campaign arm has lined up a pollster to test Mr. Jones’s strengths and Mr. Moore’s vulnerabilities. And Alabama Democrats are openly rooting for the former judge. The emails are among tens of thousands of documents that have been turned over to congressional investigators and special counsel Robert S. Mueller III’s team as they probe whether Trump associates coordinated with Russia as part of Moscow’s efforts to interfere in the 2016 U.S. election. If a star of fake wrestling shows can become president, then a guy who played a president (not to mention God) can talk about Russia. Jim Rutenberg writes that the NYT that RT and Sputnik are at the center of a Russian-directed social-media network that helped Trump. He quotes John Kelly, the founder and chief executive of the social-media marketing and analytics firm Graphika. Shortly after the election, academic and corporate clients hired him to track the proliferation of “fake news” — that is, unequivocally false content. He confined his search to social accounts that shared fake news at least 10 times during the last month of the campaign. This September, in his airy, loft-style office suite on the West Side of Manhattan, he called up the results of the study on a laptop screen. They were visualized as a black sphere on which each of the 14,000 fake-news-spreading accounts appeared as a dot, grouped and color-coded according to ideological affiliation. The sphere was alive with bursts of purple (“U.S. Conservative”), green (“U.S. Far Left”), pink (“Pro-Russia/WikiLeaks”), orange (“International Right”) and blue (“Trump Core”). Within the fake-news network, Kelly explained, RT was high on the list of most-followed accounts, but it was not the highest — it ranked No. 117 out of roughly 12,000 accounts he was tracking. Its website was the 12th-most-cited by the fake-news consumers and purveyors — ahead of The New York Times and The Washington Post but behind Breitbart and Infowars. Nearly 20 percent of the fake-news-spreading accounts, Kelly’s analysis determined, were automated bot accounts, of the sort the American intelligence assessment claimed were working in tandem with RT and Sputnik. But who was operating them was unclear — and regardless, they were far outnumbered by accounts that appeared to belong to real human beings, reading and circulating content that appealed to them. In this paranoid, polarized and ill-informed subset of American news consumers, RT’s audience crossed all ideological boundaries. In Defying the Odds, we discuss Trump's character . President Donald Trump on Sunday retweeted an animated GIF showing him hitting a golf ball at Hillary Clinton, knocking her to the ground as she boards a plane. The image was among several that the president retweeted on Sunday morning, in addition to a tweet mocking North Korean leader Kim Jong Un as “Rocket Man.” Trump has tweeted controversial animations before—notably a video of him punching a man who had the CNN logo superimposed on his face. Whiteness is not a genetic category, after all; it’s a social and political construct that relies on perception and prejudice. A century ago, Irish, Italians, and Jews were not seen as whites. “This town has 8,000,000 people,” a young Harry Truman wrote his cousin upon visiting New York City in 1918. “7,500,000 of ’em are of Israelish extraction. (400,000 wops and the rest are white people. )” But by the time Truman became president, all those immigrant groups were considered “white.” There’s no reason to imagine that Latinos and Asians won’t follow much the same pattern. In fact, it’s already happening. In the 2010 Census, 53 percent of Latinos identified as “white,” as did more than half of Asian Americans of mixed parentage. In future generations, those percentages are almost certain to grow. According to a recent Pew study, more than one-quarter of Latinos and Asians marry non-Latinos and non-Asians, and that number will surely continue to climb over the generations. Then again, there is California, where demographic change has helped to wipe out the GOP on the statewide level. Poor Jeff Sessions. First, Trump reverses himself and agrees to enshrine DACA in law. In the telephone call to Mr. McGahn, Mr. Rosenstein said he had decided to appoint Mr. Mueller to be a special counsel for the investigation. Congress had been putting pressure on Mr. Rosenstein to appoint a special counsel to put distance between the Trump administration and the Russia investigation, and just the day before The New York Times had revealedthat Mr. Trump had once asked Mr. Comey to end the F.B.I.’s investigation into Michael T. Flynn, the former national security adviser. Yesterday, he said of tax reform: " the rich will not be gaining at all with this plan." That makes no sense. In 2014, the latest year for which data are available, to the Tax Foundation finds that the top 25 percent of filers paid 87 percent of federal income tax, and the top ten percent paid 71 percent. The top 1 percent of taxpayers paid more than than the bottom 90 percent put together. How could the rich not gain from his tax scheme? So to the extent that blue collar Americans thought that the system was rigged in favor of college America, they were not entirely wrong. They also had reason to think that college America looked down on them. America’s universities are getting two report cards this year. The first, from the Equality of Opportunity Project, brought the shocking revelation that many top universities, including Princeton and Yale, admit more students from the top 1 percent of earners than the bottom 60 percent combined. The second, from U.S. News and World Report, is due on Tuesday — with Princeton and Yale among the contenders for the top spot in the annual rankings. The two are related: A POLITICO review shows that the criteria used in the U.S. News rankings — a measure so closely followed in the academic world that some colleges have built them into strategic plans — create incentives for schools to favor wealthier students over less wealthy applicants.Class-based anger was a driving factor in the 2016 presidential campaign, as white voters without college degrees vented their frustration by voting for Donald Trump in record numbers; it was the single best statistical predictor of a Trump voter. In the wake of Trump’s election, the majority of Republicans say colleges and universities have a negative effect on the country, according to the latest polling by the Pew Research Center. Young people still see college as necessary to get a good job and move up in society. But the vast majority don’t believe the higher education system is helping them do that, according to a recent report by New America, a Washington-based think tank. “Elite colleges are part of the apparatus that produces Trumpism and produces working class, white resentment,” said Walter Benn Michaels, a professor at the University of Illinois at Chicago. In a YouGov/Economist poll taken before Trump’s announcement, a solid plurality of Americans (48%) said they wanted him to keep DACA, while 29% wanted the President to end it. Democrats (73%) and independents (43%) were in favor of keeping the program. Only 30% of Republicans were, while 49% said it should be ended. After the announcement, 55% of Americans in a HuffPost/YouGovsurvey said they thought Trump made the wrong decision, with 88% of Democrats and 53% of independents giving that response. 83% of Republicans thought the president made the right decision. Broader questions about DACA that don’t mention Trump also showed more support than opposition to the program. 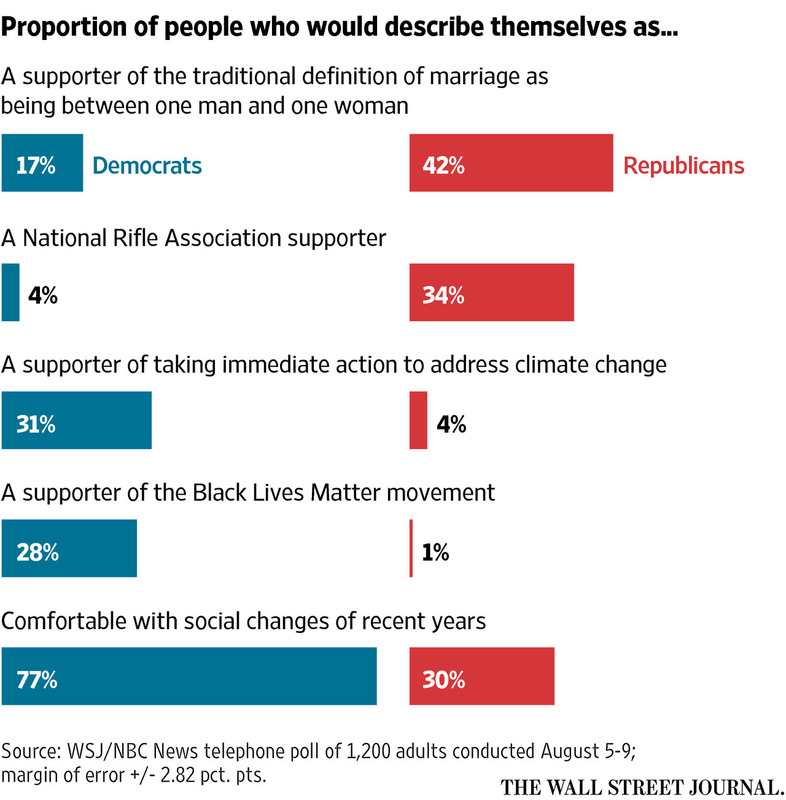 The September 5–6 HuffPost/YouGov survey asked two differently-worded questions, each of half their sample. 53% said they supported “allowing undocumented immigrants who came to the US as children to stay in the country,” while 29% were opposed. 47% said “undocumented immigrants who were brought into the country as children” should be allowed to stay in the country; 30% said they should be required to leave the country. In the YouGov/Economist poll, 55% said they favored DACA. In Defying the Odds, we discuss partisanship in 2016. In Defying the Odds, we discuss cultural reasons for Trump's victory. Trump got 60% of the non-Hispanic Catholic vote. One reason is that Democrats seem bent on insulting their beliefs. Feinstein’s comments at a hearing Wednesday of the Senate Judiciary Committee were directed to Notre Dame law professor Amy Coney Barrett, President Trump’s nominee to the U.S. 7th Circuit Court of Appeals (and, as some noted, a mother of seven). The response on Twitter was immediate and righteously indignant. Nowhere in its screed against Barrett did the group substantiate this extraordinary accusation. It cited a 1998 article Barrett co-wrote as a law student that argued that a Catholic trial judge with religious objections to capital punishment should recuse herself from deciding whether to impose a death sentence. That, of course, is the opposite of suggesting that a judge should issue a ruling based on her religion. 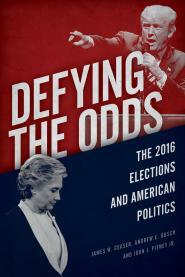 In Defying the Odds, we discuss Trump's background. Trump was a Schumer donor way before he decided to run for the Republican presidential nomination in 2015. According to the Federal Election Commission, Trump gave $9,000 to Schumer’s campaigns, Ivanka threw in $4,800, and Don Jr. and Eric each kicked in a cool $1,000. At the end of the day, that comes to nearly $16,000, a pretty good haul if you ask me. But the bond between Trump and Schumer is more than just about both guys who grew up in New York City’s outer boroughs, Queens and Brooklyn, respectively. Rather, it’s about cultural affinity and winning. In the case of Trump, Schumer and Pelosi, the two things go hand in hand. As he points out, Trump is a thoroughly urban character who romped among white ethnics in the Northeastern primaries. Like Schumer and Trump, Pelosi is as citified as you can get. She represents San Francisco, and her father and brother were both mayors of Baltimore. This bond comes at a time when Trump's nominal party becomes less and less urban all the time. For Trump, Schumer and Pelosi, all this was a no-brainer, at least this week. But for Republican legislators, it was a bitter pill. McConnell went out in front on the television cameras looking like he had been forced to eat a plate of broccoli, while Ryan was reportedly furious. Indeed, to add insult to injury, Ivanka walked in on her “daddy’s” meeting with the congressional leadership. Schumer may have been smiling, but the Republicans in the room were not. New York State budget decisions were on the table at Pocantico Hills one day when Gov. Nelson A. Rockefeller's 3-year-old son bounded in and climbed on his father's knee. The child babbled an interruption, and the Governor turned away from the senior state officials and gave his total attention to his little boy. At Politico, Gabriel Debenedetti reports that the Sanders wing is demanding purity from the rest of the party. Many Democrats are concerned that Sanders no longer has any control over the vast political network surrounding him after his 2016 campaign manager Jeff Weaver left the helm of Our Revolution in June. That national political organization, Sanders' post-campaign creation, is now led by former Ohio State Senator Nina Turner, who was a strident supporter of the Vermonter and a Clinton critic in 2016. In Defying the Odds, we discuss the cultural gap in the 2016 election. Now, a substantial majority of 64% view immigration as strengthening the country, while 28% say it weakens the U.S. The change is due almost entirely to a sharp shift in Democrats' views. In 2005, just 45% of Democrats said the country was strengthened by immigration; now the share is 81%. In Defying the Odds, we suggest an under-examined reason why Democrats were unexpectedly weak in key industrial states; union membership was way down.